You can find information about the Galaxy Tab’s battery status at the bottom right of the screen, in the status area, next to the time. When you find the teensy battery icons too vague, you can check the specific battery level by viewing the notification pop-up: At the Home screen, touch the time. You see the notifications displayed, but above that is the Tab’s current status. Listed are the date, time, Wi-Fi or cellular data network, and the percentage of battery life remaining. Heed those low-battery warnings! 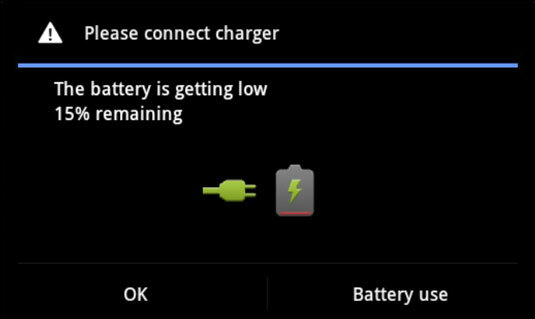 The Galaxy Tab alerts you whenever the battery level gets low. 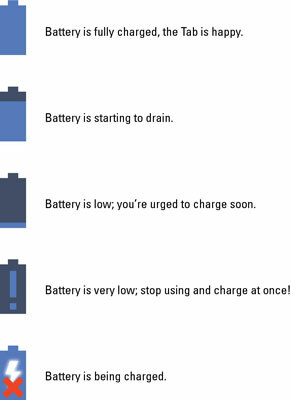 Another warning shows up when the battery level gets seriously low, but don’t wait. Either plug in the Tab or turn it off. When the battery level is too low, the Galaxy Tab shuts itself off. The best way to deal with low battery power is to connect the Tab to a power source: Either plug it into a wall socket or connect it to a computer by using a USB cable. The Galaxy Tab begins charging itself immediately; plus, you can use the device while it’s charging. You don’t have to fully charge the Galaxy Tab to use it. When you have only 20 minutes to charge and you get only a 70 percent battery level, that’s great. Well, it’s not great, but it’s far better than a lower battery level. Battery percentage values are best-guess estimates. The Galaxy Tab has a hearty battery that can last for hours. But when the battery meter gets low, the battery drains faster. So, if you get 8 hours of use from the Tab and the battery meter shows 20 percent left, those numbers don’t imply that 20 percent equals 2 more hours of use. In practice, the amount of time you have left is much less than that. As a rule, when the battery percentage value gets low, the battery appears to drain faster.